Pet insurance gives you peace of mind allowing you to care for you pets when they get hurt or sick. It enables you to choose the best care offered without worrying how you will be able to pay for their care. It is ideal to enroll your pet when they are young and healthy. Many of the wellness plans cover vaccinations, microchip and spay or neuter. Concerns of pre-existing conditions are not an issue. Owners with pet insurance save their pet from suffering by addressing problems early on and caring for their pets' preventative needs. yearly dental cleaning, heartworm preventative and tick control products. 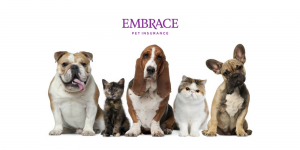 We have pamphlets from reputable pet insurance companies and encourage you to go on their websites or call them for additional information. Insurance has helped countless owners save their pets' lives when they have been injured or become sick.